A hilarious and heartrending account of one mother’s journey to understand and reconnect with her high-spirited preteen son—a true story sure to beguile parents grappling with a child’s bewildering behavior. Popular literature is filled with the stories of self-sacrificing mothers bravely tending to their challenging children. Katherine Ellison offers a different kind of tale. Shortly after Ellison, an award-winning investigative reporter, and her twelve-year-old son, Buzz, were both diagnosed with attention deficit/hyperactivity disorder, she found herself making such a hash of parenting that the two of them faced three alternatives: he’d go to boarding school; she’d go AWOL; or they’d make it their full-time job to work out their problems together. They decided to search for a solution while Ellison investigated what genuine relief, if any, might be found in the confusing array of goods sold by the modern mental health industry. The number of diagnoses for childhood attention and behavior issues is exploding, leaving parents and educators on a confusing chase to find the best kind of help for each child. 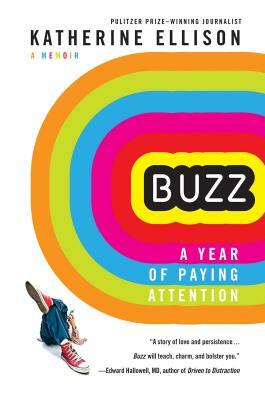 Buzz, a page-turner of a memoir, brings much relief. It is immensely engaging, laugh-out-loud funny, and honest—and packed with helpful insights. Katherine Ellison is a Pulitzer-Prize winning investigative journalist, former foreign correspondent, writing consultant, author of four books, and mother of two sons.